DIVINE VICTORY was recorded on June 15th 2011 with a 15-voice choir and a seven-piece band. KEKE decided to take the Gospel back to the streets focusing on the struggles and relevant stories that our nation goes through in everyday life. DIVINE VICTORY is a spiritual motivation that encourages this boy from Soweto who sees God's favour after a four-year absence from the music industry. THIS project is a testimonial that when God has called you, no matter what the circumstances you go through, He will finish what He has begun in you. THE album starts with a Pedi song – Hayo Mathata – meaning "There is no problem when God is with you". KEKE continues on his journey to discover talent and features quite a few acts he has worked with for some time. These included Philemon Madua (Philly), Lucky Radebe and many more who have played a role in his life. This is yet another trend-setter with many songs both old and new that he has written. AS always, Keke covers a large age group and several languages from Xitsonga to Sotho, Pedi, English and Zulu. Everyone will find something in this project, as Hillsong Vineyard lovers will find the Worship Song I Love You quiet, soothing and very uplifting. 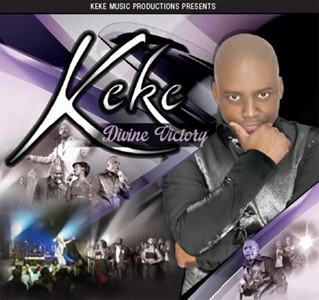 DIVINE VICTORY is yet another Keke Worship Album that will bring families together. DIVINE VICTORY is distributed and part marketed by Revolver Records.